Probably, if you are reading this article, you are a new reader of my blog as I have had many posts before but they were in Russian only. However, in nearest future I will be required to switch my language from Russian and Ukrainian to English. That’s why I decided to do it sooner than later and here is my first post in English! :) I will be happy to hear any feedback from your side, which will improve my English and help me to feel good in future. I started to learn Microsoft Azure since the first announcement during Build conference in 2008 but the first real experience I got in 2010 only. At that time, Microsoft started to push a stable version of the platform to clients and we got several requests from our partners about technical support. During that time, I worked with the biggest Ukrainian media holding and helped to deploy several applications for Windows Phone 7 and one of them was related to Microsoft Push Notification Service. The client owned the biggest soccer portal in Ukraine and their technical staff wanted to implement a service, which could allow to notify all subscribers (primary WP and iOS) of the portal about some changes during live soccer games worldwide. I was not a pro in iOS applications, that is why I will describe the solution from Microsoft platform perspective but you can easily interpolate it to any other platform. So, it was not too hard to realize a simple Windows Phone application, which provided last news and allowed receiving Toast notifications but in case of server side, we expected several complex problems. The biggest problems were about hardware resources and Internet capacity. The portal has hundreds of thousands visitors during any kind of games and it was too hard to find some more servers as well as to guarantee quality of Internet channel to organize sending messages to Microsoft Push Notification Server to all subscribers during the same amount of time. That is why we decided to move server side of service to Azure. In 2010 Microsoft already presented Cloud services (Web and Worker roles), Storage services (Tables, Blobs and Queue) and SQL Azure. We used them all. Let’s look a schema below, I will try to describe the solution in more details. First, we implemented a web service (web role), which was able to store data from Windows Phone devices about Notification Channel URIs. The unique URI generates by Microsoft Push Notification service for the specific device and it could be used to send notifications to this device. So, if you have 100 devices, you should have 100 URIs to send message to each of them. In order to store information about URIs and users we used SQL Azure. On the second step, we created a Web service (it was Web role but we can utilize the existent Web role from the previous step), which allowed to receive messages from an operator (a human on client side or something else). The messages contained some information about a game status, which should be send to subscribers. Of course, we could not use this Web service to deliver these messages to our subscribers, because it could take some time (up to several hours, in case of big number of subscribers) and we needed to send a response to the operator as soon as possible. That is why Web service stored new messages to Queue in Azure Storage. This structure is adopted to simultaneously access to messages inside and it works very well, if you use several instances of Worker role for processing of the messages. On the last step, we created a Worker role, which was sending the messages to the subscribers. We were able to monitor the queue and increase or decrease number of instances of Worker role based on number of games, number of subscribers and number of messages in queue. The proposed solution is stable and flexible but there are some disadvantages. From the first sight, the solution is too complex and you need to know several Azure features in order to realize it. From the second side, you should be aware of the price of separate services like Cloud, Storage, SQL Azure. These disadvantages could stop many developers from realizing of the simple and common solution like notification to clients applications. But it was just a background for “native development” on Azure. Since that time Microsoft have realized several good solutions in a box and one of them is Azure Mobile Services, which contains a Notification Hub component. Let’s look this component in details. Notification Hub allows us to work without the knowledge of the details that are happening in the background. We are not aware about SQL Azure, Worker roles, Queues and client platform. We still can use Web role to manage authentication, to format messages etc. In the simplest scenario, we just need the Notification Hub, which provide interfaces to sending messages via operator applications as well as to updating notification channel from client devices. We just need to create a new Notification Hub service inside Azure account, configure it and the service will allow to subscribe unlimited number of devices as well as to send messages to them. Additionally, Notification Hub supports different types of client platforms like Windows platform, iOS, Android etc. In other words, Notification Hub is a black box, which allows us to realize client applications and “operator” applications only. 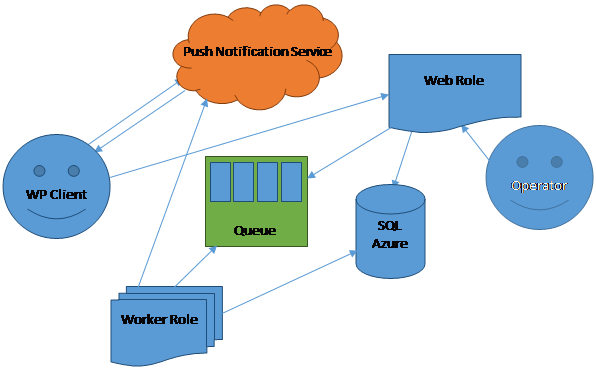 Notification Hub is a ready to use common scenario, which was prepared by Microsoft. Therefore, you should be able to understand purpose of the Notification Hub. I am planning to show some features of the Notification Hub in next article. option? There are so many choices out there thatt I’m completely confused ..